Asphalt temperature and the outdoor temperature are two very different things. When the outside air temperature is 77 degrees the asphalt in the sun is 125 degrees. You can fry and egg at 131 degrees just imagine how your dog feels as you drag him along to the farmers market or outdoor festival being held on asphalt. As a basic ‘rule of paw’-If the pavement feels too hot for your barefoot, it is too hot for Fido’s. Pressing your own bare hands and feet on the pavement for at least 7-8 seconds is a recommended strategy to assess heat level. 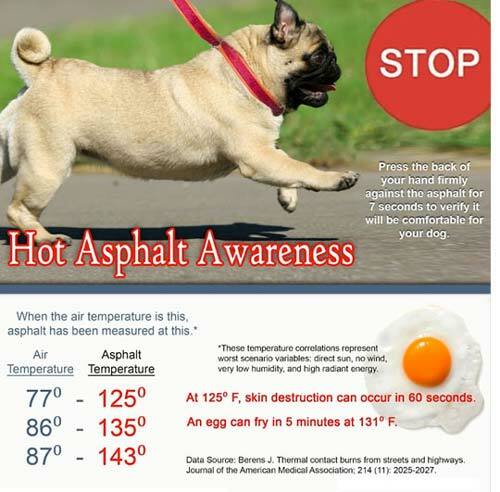 Asphalt soaks up the heat all day and can only cool down at a certain rate and only when the sun retreats- so pavement that was deemed safe for a walk at 9 am may differ greatly at high noon and into the early evening. If you want to take an outing with your dog in the summer think water! Even non-water dogs still like to run along the edge and get their doggie tootsies wet and your feet will like it better too. 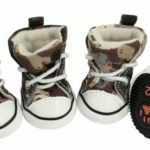 Check out the options for dog boots and pad care for your furry friends here.